Stryke Airsoft has a few items known to the collectors of airsoft. From the late 1980’s JAC, formerly in conjunction with Asahi Firearms, pioneered the first airsoft guns. 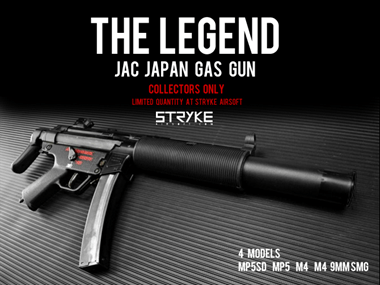 The JAC guns available are the MP5 A5, MP5 SD2, the CAR 15 9mm, as well as the CAR 15 9mm version. All JAC items are available for viewing on ebay, to view the items, visit our website under the category “Airsoft Collectables” for a direct link to each individual auction. 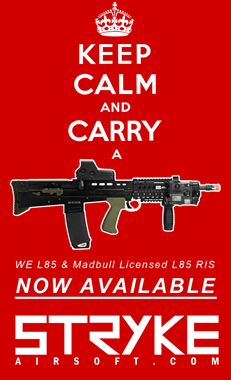 Also don’t forget to check out our WE L85 with Madbull Airsoft’s new Daniel Defense L85 RIS pre-installed, come check out this killer deal!